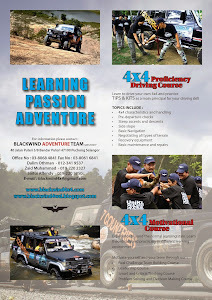 Just to share the info about the progress of our 4x4 Expedition to 7 Countries which include Malaysia, Thailand, Cambodia, Vietnam, Laos, China and Myanmar. The team have organized the Media release on our program on April, 8 2011 to inform all over Malaysia on our trip. We also hope to invite more sponsorship for our 21 days expedition. The expedition will be departure on May, 25 2011 and we will be back to Malaysia on June, 14 2011. It is a lot of work to be done to make the expedition going smoothly as we planned. The route also have to be changed due to timing and as such we also have to re-schedule the trip 2 days earlier. We have to prepare all the visas, last check on our 4x4 and the most important is to get more sponsor. It is a lot of money to be spend preparing every thing but it will be our challenge to make this trip happen. Hope everthing will be going as we planned. Wishing the whole team good weather and safe travel. Thank you..do follow our expedition.